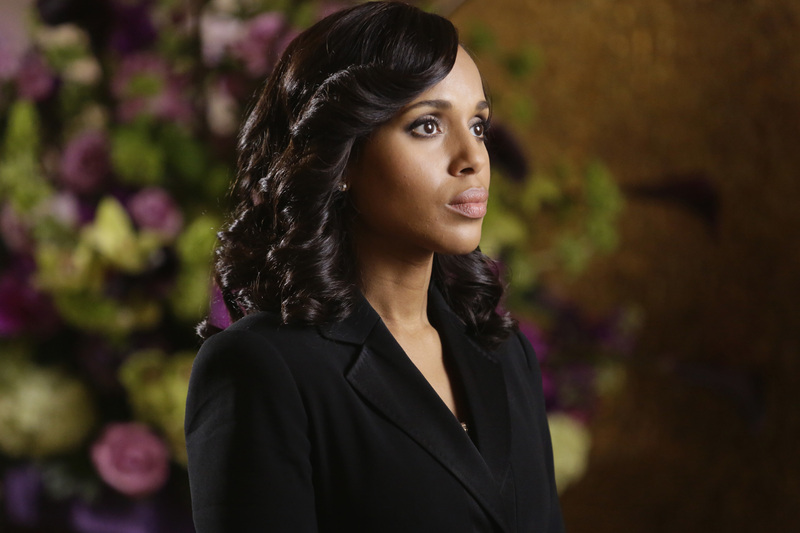 Scandal, the smash political soap opera starring Kerry Washington, definitely lived up to its name during yesterday’s explosive episode that showed Olivia Pope (Washington) finally cracking under the pressure. One of the biggest storylines this season has been the fallout from Olivia’s kidnapping at the behest of VP Andrew, when she was terrorized and nearly sold. (Yes, sold.) Obviously this would be traumatizing to anyone — sometimes I wonder how the actors themselves aren’t traumatized by the extreme violence they have to portray — and creator Shonda Rhimes made a good choice showing how it has impacted Olivia and her ability to not only do her job but to live her life as well. At first it seemed like she’d settle for getting revenge through her proxies and drinking herself into oblivion. But last night showed a new side of Liv: the murderous side. Spoiler alert ahead: Circumstances conspired to put Olivia and Andrew together in the same room, and she kills him. But it’s how she does it that really has people talking — in between flashbacks of her kidnapping, typical of what one might ascribe to post-traumatic stress disorder, she smashes his head in with a chair. Brains everywhere. It’s bloody and gross and yet a seemingly satisfying ending for both of them. That’s all fine and good for fictional characters, but as a real-life person who’s struggled with PTSD in the past, courtesy of a sexual assault in college, I was not thrilled with the show’s portrayal of the mental illness. At the very least, it didn’t seem very accurate. For me — and for most people I’ve talked to — PTSD flashbacks are more paralyzing and terrifying than anything. But giving Olivia a mental illness and then having her snap and become a murderer seems to sensationalize PTSD while invoking the tired stereotype that mental illness makes people violent. In reality, mentally ill people are far more likely to be a victim of a violent crime than to perpetrate one. A lot of the problem comes from misconceptions about PTSD often popularized in TV shows and movies. While it’s often thought of as a soldier’s disease, the truth is, it can affect anyone. The National Institute of Mental Health estimates that 8 of every 100 people will experience PTSD sometime during their life. Women are more likely to be affected than men. PTSD is always triggered by a traumatic event. This can certainly be things related to war or fighting in the military but can also include things like physical or sexual abuse, a car accident, witnessing a violent crime, a natural disaster or the untimely death of a loved one. During the event, your natural fight-or-flight instincts take over, and for most people, they subside shortly after the event is over. But for some, the feelings of stress, danger and fear persist long afterward, causing nightmares, paranoid thoughts and even daytime flashbacks that are so real they almost feel like hallucinations. And I can tell you that these flashbacks are absolutely real and utterly terrifying. But they’re not normally violent. Studies done by the U.S. Department of Veterans Affairs have found some links between PTSD and an increase in violent behaviors, defined as everything from slapping to homicide. One study, for example, found that the risk of committing a violent offense rose from 3 percent in the healthy population to 33 percent in the PTSD population. But, they caution, once you take alcohol out of the equation, the link disappears almost entirely. So perhaps instead of saying PTSD causes violent outbursts, it would be more accurate to say that PTSD increases alcohol abuse, which has long been known to cause violence. Blame the booze, not the brain. But there is one situation where PTSD sadly does clearly lead to increased violence — and that’s against the sufferer themselves. PTSD increases self-harming behaviors, including alcohol and substance abuse, eating disorders and even suicide. This is why it’s so, so important that people suffering from it get the help they need — not because we’re worried about them snapping and killing someone with a chair, but rather because we’re worried about them hurting themselves. PTSD is highly treatable with therapy and medication and doesn’t have to be a lifelong struggle. And that’s what people with the mental illness need to hear the most: There is hope, things will get better, you will not always feel this sad and scared. Scandal missed a real opportunity to open up the discussion about PTSD and how to deal with it; instead, the show took the sensational option. Sure, it’s TV, but the last thing sufferers of mental illness need is to add becoming a murderer to their already very long list of fears.